First and foremost I will like to express my heartily thanks to Mr. Ram Prakash (HOS/WO and IED) for their kind guidance in my summer internship. My summer internship helps me to learn about Production Planning, Material Management, Cost Accounting and 5S. Ordnance factory Muradnagar is a metallurgical factory under the Ordnance Factory Board, Kolkata (Ministry of Defence) came into existence as a Transplantation Project during the Second World War with effect from 1.3.1943. Initially, production started with one Heavy Steel Foundry having one Electric Arc Furnace of 7 M.T. Capacity, 2 machining sections. The factory is a premium casting and forging unit among family of 40 ordnance factories in India. These Sections look after the Production Planning/Reporting, Liaisoning with other Factories/Establishments, Contract review, Customer complaints, Budget, Audit and Financial Monitoring activities of the Factory. OFM has the specialization in Alloy and Steel Castings- Armoured as well as Non-Armoured, Ammunition Hardware, Grey Iron Castings for Ammunition Hardware and Moulds and open die steel forgings for Hot die Steel and other tool steel. OFM main products are Aerial Bombs, Ammunition Hardware (Steel), Ammunition Hardware (Grey Iron), Forging Products. I was given an opportunity to study on the Project “Overview of Production, estimate revision and its impact on cost”. In this project I worked with Planning section, Works office, Material Management section and Account section. First production is estimated for next month. Exercise of control over expenditure in a manufacturing business is the main function of the Production Manager. Production management is an integral part of all good management. The ascertainment of production costs is not an end in itself, but the object is to provide means whereby costs can be controlled. Time to time target was revised to attain minimum cost. It is necessary for a Works Manager to be an expert in the Mechanical processes. His works involves and possess the ability to control men, but these abilities do not complete the requisites for the successful performance of his function. He must also possess a cost sense, or ability to analyse the cost of operations, materials and expenses under his control with a view to carrying out manufacture at the minimum cost. He is engaged to produce at or below a predetermined cost, or in the absence of budgeted cost, at the minimum practicable cost. A costing system must be adopted to suit the nature of the work it deals with, and this can only be achieved by the fullest collaboration between the Works Manager and the accounting department. 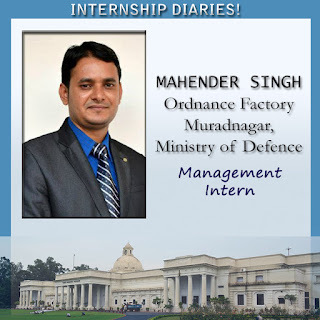 At last I must say that it was a fantastic experience to work with Ordnance Factory Muradnagar.